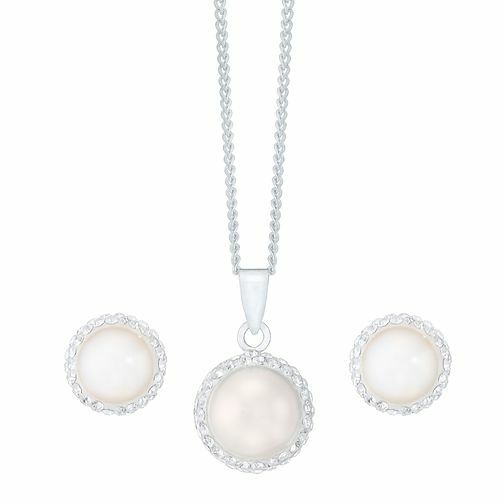 Exuding sophistication, this irresistible sterling silver pendant and stud earrings set features a gleaming cultured freshwater pearl pendant along with matching stud earrings. Surrounds of glittering crystals add a sparkling finishing touch. Sterling Silver Cultured Freshwater Pearl Pendant & Earrings is rated 3.0 out of 5 by 3. Rated 3 out of 5 by Anonymous from Beautiful to look at Brought this for my wedding day a few weeks before, opened it on the day and it had started to tarnish, thankfully someone came to my aid to clean it up. However not even a year old and the tiny stones around it have fallen out from both earrings and the necklace! I would understand if I had kept them in 24/7 but I remove all my jewellery each night.